Mighty Sports Basketball was born out of Caesar Wongchuking and his passion for the game. He runs the team together with his sons Caesar Angelo and Keith. The team became first known to basketball fans in minor basketball leagues such as the Republica Cup (an invitational basketball tournament held in Malolos, Bulacan as part of the commemoration of the First Philippine Republic, known as the Malolos Convention). At the time, it became the sponsor of the Adamson Falcons men's basketball team and the Bulacan State University Golden Gears men's basketball team in the Filsports Basketball Association, and the Philippine Dragon Boat Team. In 2014, the team, led by former PBA player Kenneth Duremdes and Kris Rosales, bagged the second Republica Cup title, after winning the finals game against Malolos Republica, 86–84. One year later, the team did not make it to the finals after losing the semifinals match against AMA University. On February 4, 2016, Mighty Sports, now-led by former UAAP MVP Kiefer Ravena, successfully reclaimed the Republica Cup championship, beating Hobe Mackway Travel in the finals game, 85–82. In addition, Bright Akhuetie was named as the Tournament MVP. On March 2016, the team joined the Pilipinas Commercial Basketball League. Historically, this is the first entry into a major basketball league. 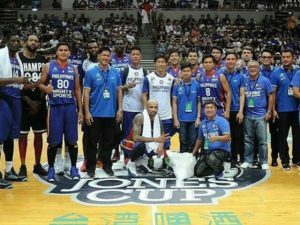 Ravena, a 2016 PBA draft prospect, together with Ty Tang, who came out of retirement in the Philippine Basketball Association, and import Bright Akhuetie are some of the players who retained in the team's line-up for the Champion's Cup. Mighty Sports also appointed Bo Perasol as team consultant, Mike Fermin as head coach and Charles Tiu as assistant coach of the team, which is one of the two new teams that competed in the 2016 PCBL Chairman's Cup, alongside SCTEX Road Warriors. On its first game, Mighty Sports completes an upset victory against Founder's Cup champion Jumbo Plastic Linoleum Giants, 79–70 in the opening day of Champion's Cup on March 6, 2016. Ravena led the team's campaign with 16 points. The team represented the Philippines in the 2016 William Jones Cup, with 7 foreign reinforcements leading the team, in lieu of the Gilas Cadets who were not available for playing. Mighty Sports Philippines Basketball team beat team A of host nation Taiwan, who were fielding a second team, on their opening match. The South Korea national team fell to Mighty on their second match. For their third match, Mighty defeated the US team Sacramento State Hornets then dominated Japan on their fourth by a blowout of 21 points. 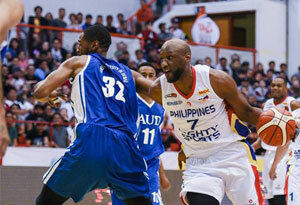 Mighty then sank the Indian national team by a 20-point victory to remain the only unbeaten team. The Philippine team then cemented their title by beating Iran and further extended their winning streak against Egypt and finally swept the entire competition beating Taiwanese Team B. 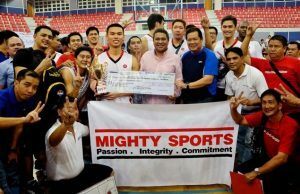 Mighty Sports returned to domestic basketball after it entered in a partnership with the Bulacan Kuyas of the regional Maharlika Pilipinas Basketball League. The partnership was established between Mighty Sports owner Caesar Wongchuking and the Bulacan Kuyas management led by owner Jonathan Sy-Alvarado prior to the start of the MPBL 2018 Datu Cup. The Bulacan Kuyas officially renamed themselves as the Bulacan Kuyas-Mighty Sports as part of the agreement. In December 2018, Mighty Sports' intention to re-emerge in the 2019 Dubai International Basketball Championship was announced by former NBA player and now team import Lamar Odom via social media who also is on a bid to return to professional basketball. The team aims to redeem a forgettable 2017 stint hiring the services of decorated imports Randolph Morris and Justin Brownlee. Mighty also snagged promising Fil-Am recruits in Jeremiah Gray and Roosevelt Adams who made waves in the US NCAA Division II with their accurate shooting, defense and athleticism. Adding beef to the team are a slew of ex-pros, former Mighty players and amateur rising stars including Juan Gomez de Liaño, Jason Brickman, Gab Banal, Justin Gutang, Santi Santillan, Troy Rike, Angelo Wongchuking, Jett Manuel and Joseph Yeo. The team is led by Charles Tiu at the helm with a strong supporting cast in veteran coach Jong Uichico, TY Tang and Dean Castano.